If you are interested in joining the Parish 100 club, please click here for an application form. Despite the weather the Parish BBQ last Sunday was a great success, comments received was how well it worked actually eating in the hall, sitting and sharing a table and getting to know other parishioners. The meat, rolls, ice cream and tableware was bought by generous donations and profit from coffees served after Sunday Mass. A huge thank you to the parishioners who support the coffee mornings, donations and those who donated food on the morning. There was some money left which has gone towards the cost of the gas cylinder. Thank you to everyone who came and the helpers. 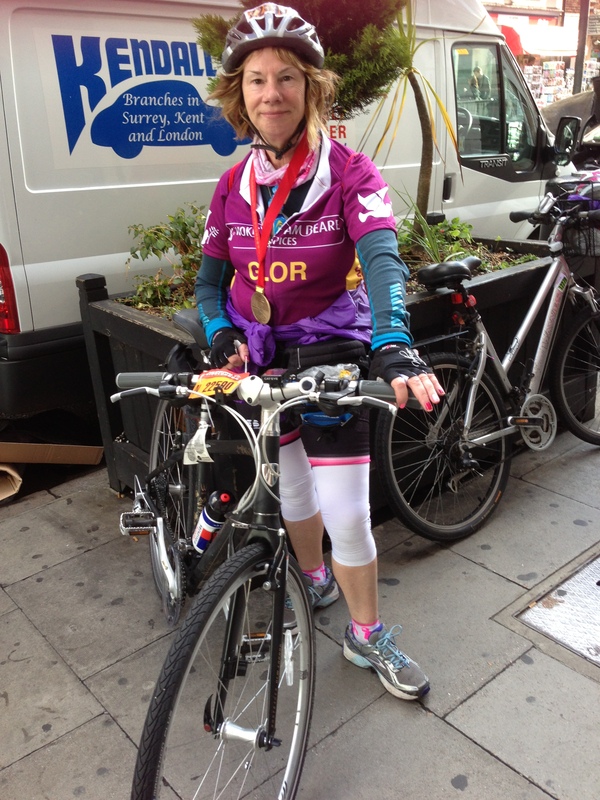 Gloria and her family thankfully safely completed their bike ride recently and Gloria on her own managed to raise the amazing sum of £995.78 but the four of them combined raised £5K. 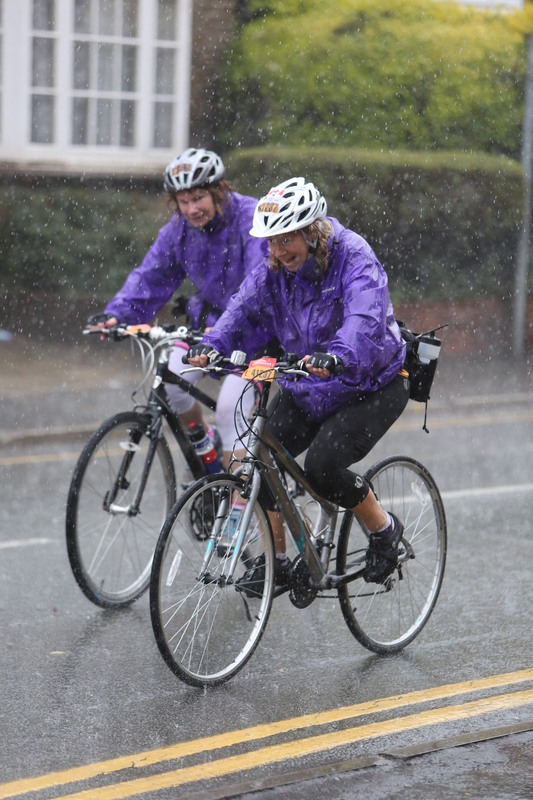 Many congratulations to all of them on their wonderful achievement in what was dreadful wet and windy weather. 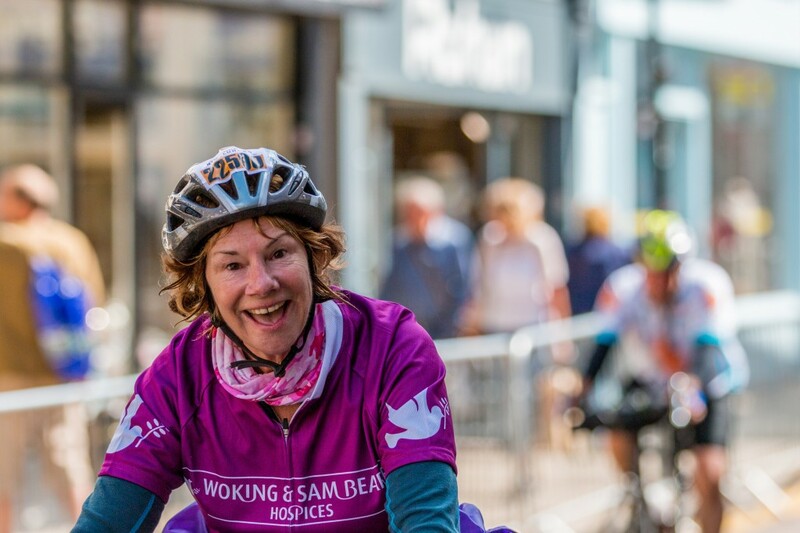 Gloria would like to thank everyone who so kindly supported them by making a donation for the Woking Hospice. 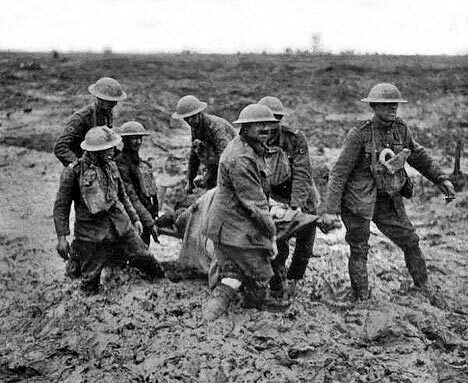 Soldiers fought largely in trenches during the war, and thousands suffered from stress,known as shell-shock. The British and French trenches were often squalid, whereas the German trenches were almost luxurious in comparison, with bunks and decent cooking facilities. On 4th August, 2014 we shall be holding a Commemoration Service for our two Churches at Holy Angels Church, Ash GU12 6LU at 7.30pm to remember all those brave men and women who so bravely gave their lives that we might live in peace. Amongst those we will be remembering is the Father of Molly Llanwarne, namely Robert John Ward, who was born in Aldershot who enlisted under age in the Queen’s Royal Regiment. Molly’s father thankfully survived a gas attack and later went onto marry Molly’s Mother. Also Private Cecil Thomas Whitworth who enlisted in the Royal Army and sadly died at the young age of 21. A Presentation of the Books of Remembrance of those in our Local Communities who have died and a Remembrance for the Germans who Died will take place. Below is a copy of a Testimony of friendship document which Fr. 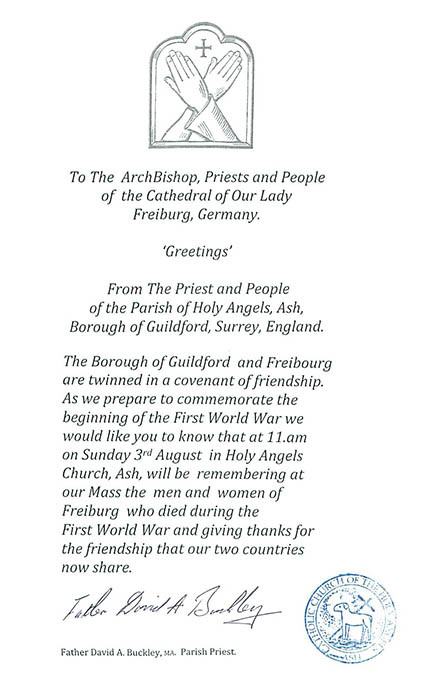 David has produced which has been sent to the Priest in Germany to let them know that we shall be remembering them and praying for them at our Commemoration Service. The Mail printed a dozen accounts of how, on Christmas Day 1914, arms were laid aside and soldiers from opposing armies ventured out of their trenches and into no-man’s land to wish each other peace. Here was a mass act of fraternisation that sent shivers through the military authorities. But, for all their head-shaking denials, it really happened. ‘At daybreak the morning after we had repelled an attack, we saw that the Germans had collected their wounded, with the exception of one man who lay groaning in agony halfway between the trenches. Our captain jumped forward from his trench. The Germans fired and he was hit. He staggered but with a magnificent effort kept his feet and rushed on towards the wounded German. Then, although badly wounded, he picked him up and carried him direct to the German trenches. We heard the roar of cheers as he gently laid the body down and saluted. A German officer climbed up from the trench and removing his own Iron Cross, pinned it on our hero. Sadly, back in our lines the captain died from his wounds and I am broken-hearted that his cross is a wooden one rather than the VC he deserved. During World War 1, dogs were used to carry messages in capsules attached to their body. Dogs also carried and placed telegraph wires in important areas. Pigeons were also used during the war. About 500,000 pigeons were regularly dropped into enemy lines by parachute, and then sent back with messages. Cannons and artillery were often extremely loud. In 1917, the explosives used to destroy a bridge in France could be heard over 130 miles away in London. 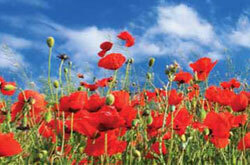 Wearing poppies in the town today? Why not a beautiful white rose? In the fields where poppies grow. The Blood the solders shed. Are you sad or are you in pain? That we may forget and go to war again. 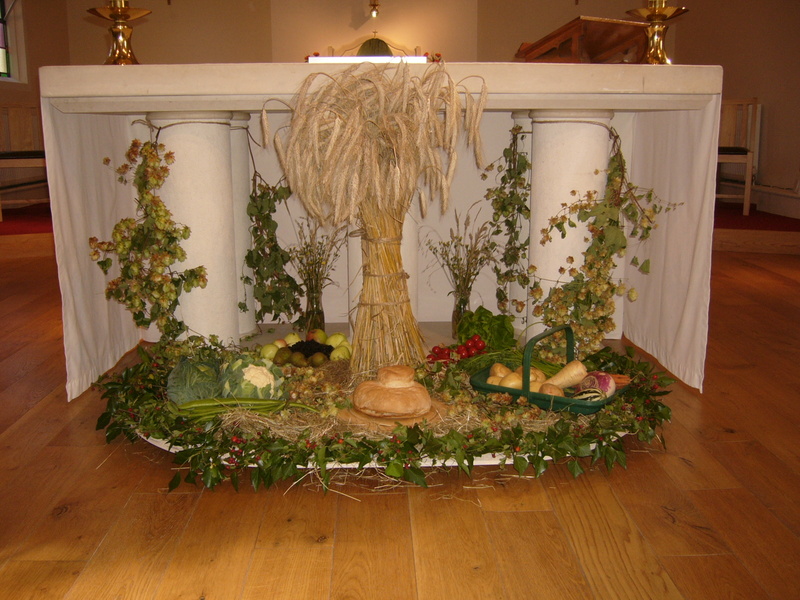 Our wonderful Harvest display this year was once again designed by Maggie Batchelor. The wonderful loaf was baked by Chris Michie who also assisted Maggie with the display. We didn’t think Maggie could beat her wonderful display of last year, but she seems to have succeeded! 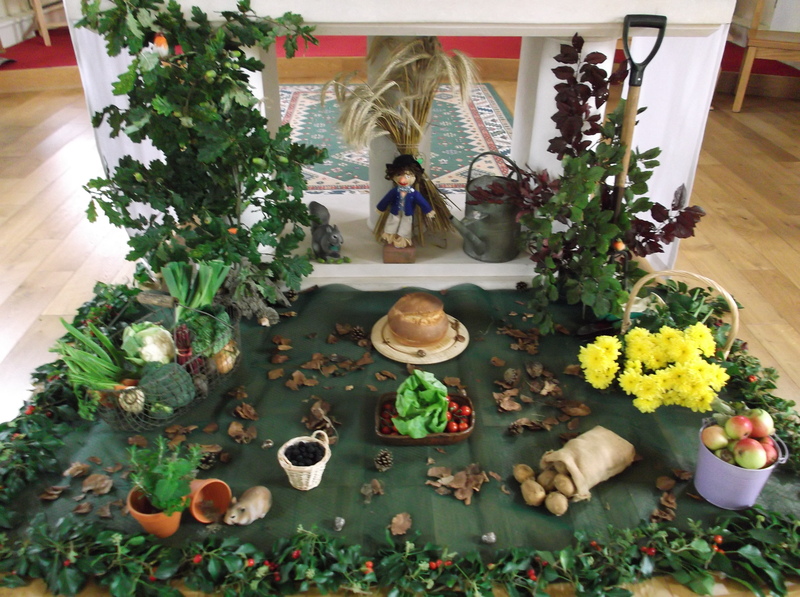 Many thanks to both Maggie and Chris for their time and effort in helping to make our Harvest Sunday celebrations so special. 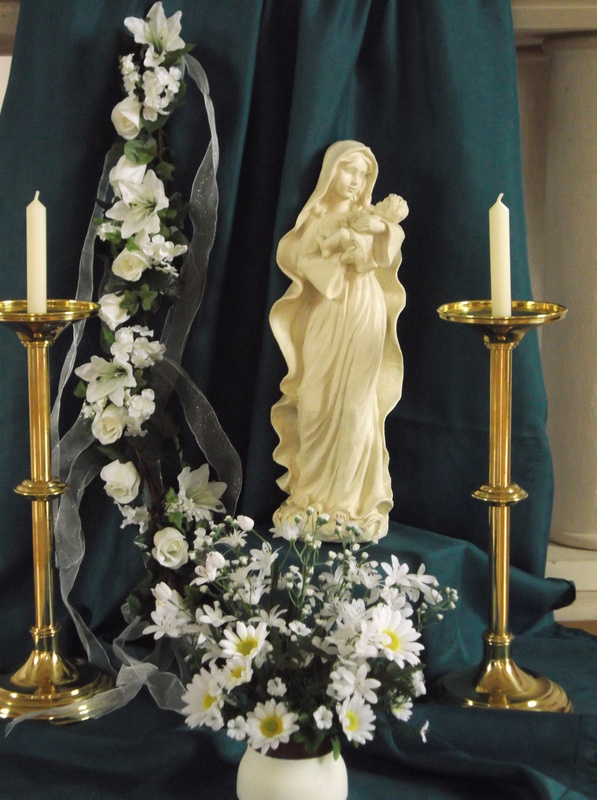 The above display was put together by Maggie Batchelor and we once again are very grateful to Maggie for the beautiful arrangement to help us celebrate the Assumption of our Blessed Virgin Mary. The Parish Newsletter will in future be published on this website on a Friday in time for the forthcoming Sunday Mass.Items for the Newsletter need to be submitted no later than Wednesday middday for publication on the following Sunday. On the first and third Sunday of the month tea and coffee will be served. Why not come and join us for a chat and perhaps make some new friends? Judy D’Sa now manages the gift shop at Holy Angels which is always open even if she is not actually present. Just ask for the keys and place the money in the little money box for the item purchased. Feel like you need a break from the pressure of work, school or what is going on at home during the week? Our WEEKDAY MASSES at Holy Angels (Wednesday 9.30 am and Friday 12 noon) are proving very popular. They are short and celebrated in a carpeted side chapel which is proving ideal for young mums with little children. Coffee and Tea (sometimes also soup) are served after the Masses for anyone who would like to stay on for a chat amongst friends. Recent polls indicate that some Catholics don’t think that going to Mass every week is important. Perhaps you have friends or relatives who feel they can be good Catholics without going to Mass. If they asked why you go to Mass, how would you respond? “For to me,” St. Paul wrote, “living is Christ” (Phil. 1:21). To be truly Catholic is to know Christ as our Lord and God and to follow Him in our thoughts, words, and actions. Jesus gave us the Mass to unite us to Himself and offer the grace to think, speak, and act like Him. Jesus says in John 6:56, “Those who eat My Flesh and drink My Blood abide in Me, and I in them,” so the Mass is essential to us as Catholic Christians. These are the first and most important reasons for going to Mass! Here are others. Most people wonder about the meaning of life. How did life begin? What happens to us at death? Is there a God? If there is no God, we are accidents that ultimately came from nothing and are going nowhere. If there is a God, we have been created as God’s beloved children who are destined for eternal happiness. God tells us an essential way to express this faith in the Third Commandment: “Observe the sabbath day, to keep it holy.” Those who carelessly miss Mass erode any faith they may think they have, just as the refusal of acts of kindness erodes love between spouses. If we believe in God, we must obey the third Commandment. We must participate in the Mass to express our faith in Christ’s teachings about the meaning of life. Another reasons for going to Mass and another proof of its importance is that it is the only thing Jesus asked us to do for Him. Jesus asked us to do many things for others and for ourselves, but only one thing for Him: “This is My Body, Which is given for you. Do this in remembrance of Me”. (Lk.22: 19). How can we be loyal followers of Jesus if we fail to do this one thing? “I can be a good Catholic without going to Mass.” This statement is false. We cannot be good Catholics unless we do what Jesus asks of us. “I can pray at home, or in the woods. I don’t need to go to Mass.” It is true that we can pray at home or in the woods, but it is not true that we don’t need to go to Mass. We are not the ones to decide what sort of worship God desires. God is, and God tells us that private prayer is not enough. We need to pray in private (Mt. 6:6) but we must also pray with others (Mt. 18:20). Private prayer is essential to our spiritual growth, but essential also is prayer with others, especially the prayer mandated by Jesus. “Mum, Dad, why do I have to go to Mass?” When children as this question, they are really asking, “Mum, Dad, why do you go to Mass?” The best answer to a question about the Mass is peronal witness. A good reason for going to Mass is that God asks so little of us. On average, if we live to be 80 years old, we will spend about three and a half years reading, five years talking, six years getting an education, six years riding in a car, seven years eating, 11 years watching television and in recreation, 14 years working, and 27 years sleeping. If we live to be 80 and spend an hour attending Mass every Sunday and five minutes praying every day, it adds up to six months! How can we refuse so little to a loving God who has given us so much?